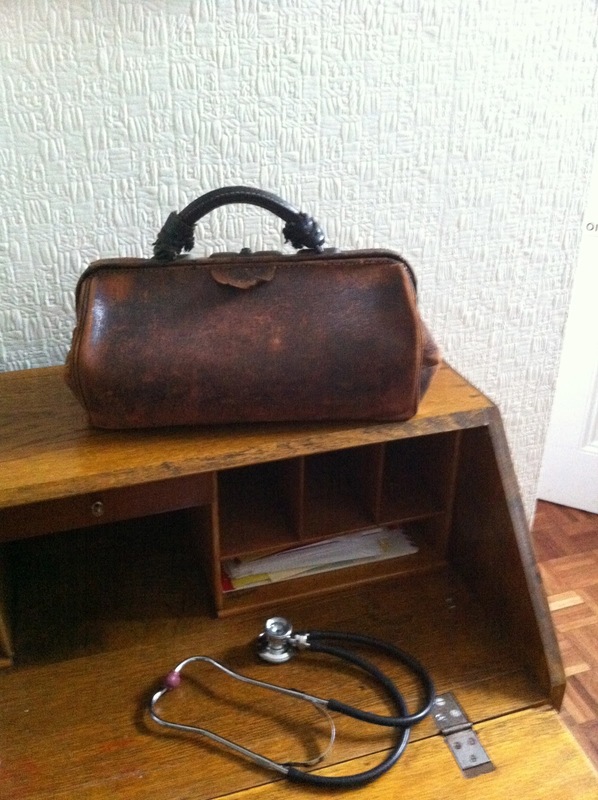 It is almost a year since I last wrote a post in The Doctor's Bag. I thought that after Cheryl and Livia published my book over at Sundown Press that I had said all that I needed to about past practices in medicine and surgery. 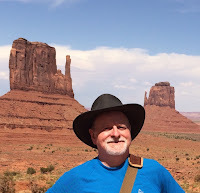 My recent research activities, however, have convinced me otherwise, so I've packed the bag once again to tell you about other aspects of the medical art. The practice of medicine is something that every culture has developed. When people are unwell they inevitably try to do whatever they can to regain their health. It is not that we have an innate knowledge of how to regain our health, but we will seek out individuals who have knowledge of things that will help and we will put our trust in them and in their ability to heal. These two things, knowledge and trust underpin the practice of medicine. Although no single culture can truly claim to have discovered medicine, yet the appearance of a recognised healing art seems to have gone hand in hand with the development of societies. At first in tribal communities the shaman, medicine man or woman would provide a proto-medicine which would be mainly based upon magic and a communication with the deities who were perceived to control the world. Then as civilisations developed and the organised worship of state gods was introduced, so would we see the rise of the priesthoods. It was natural that they would provide a rudimentary practice of medicine and the priest-physician or doctor would appear. Although the origins of these priesthoods are buried back in the mists of antiquity, yet thanks to the development of writing, on stone, clay and papyrus, archaeologists and historians have been able to piece together a substantial body of evidence which shows that even in the earliest of cultures doctors were developing principles and practices that had some validity as medicines. We know also that bone-setting, assisted births and surgical practices such as trephination, the boring of holes in the skull, were practiced in even earlier times. If you look at the symbols that are used to depict medicine today, you will see that they form a direct link to antiquity. In the west the caduceus is generally thought to be the symbol of the medical and related professions. There is confusion about this, however, since there are in fact two symbols used by different medical organisations, and other health-related organisations have made adaptations of their own to indicate a particular feature of their calling. 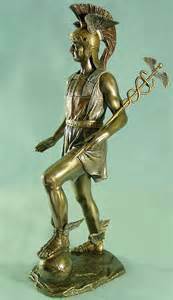 The Latin word caduceus refers to the wand of the Greek god Hermes, known to the Romans as Mercury, the messenger of the gods. Caduceus was also an old name for epilepsy. This is interesting, since in ancient days it was considered to be a sacred disease. The caduceus is represented by a staff with two wings and two snakes coiled round it. In Roman days a white caduceus was used as a symbol of peace. From the sixteenth century it has been used as a symbol of the medical profession and it is now the adopted symbol of the US Army Medical Corps. It is also used by the Catholic Medical Association and the Royal College of Radiologists. 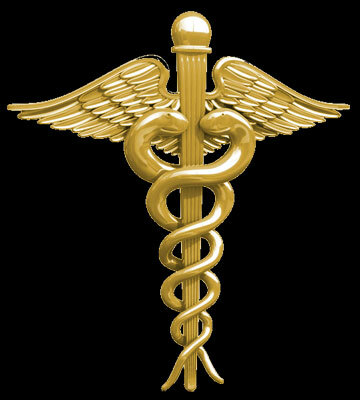 The Rod of Asclepius is the other symbol and consists of a forked staff or rod with a single snake entwined about it. 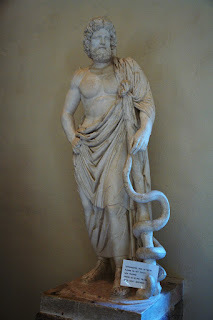 Asclepius was the Greek god of healing, whom the Romans adopted and called Aesculapius. The snake seems to have been a symbol of wisdom, fertility, regeneration and healing in Middle and far Eastern countries dating back to at least 2,600 BCE. The snake associated with Asclepius is a species of rat-snake, Elaphe longissima, which is native to south-east Europe and Asia Minor. It is also found in areas of Germany and Switzerland, where it is thought the Romans introduced it at various health resorts. 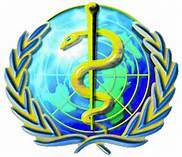 The Royal Society of Medicine, The British Medical Association and the American Medical Association use the rod of Aesculapius and a single snake as their logos, as does the World Health Organisation and the Royal College of Psychiatrists. 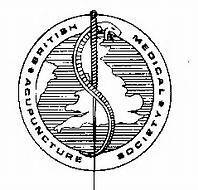 The British Society of Medical Acupuncture have modified the rod of Aesculapius to show a needle with a single snake, on the background of the Yin and Yang symbol. Talking of the Yin and Yang symbol, medical practice in ancient China, of course developed differently over the centuries, possibly owing to its isolation from the rest of the ancient world. 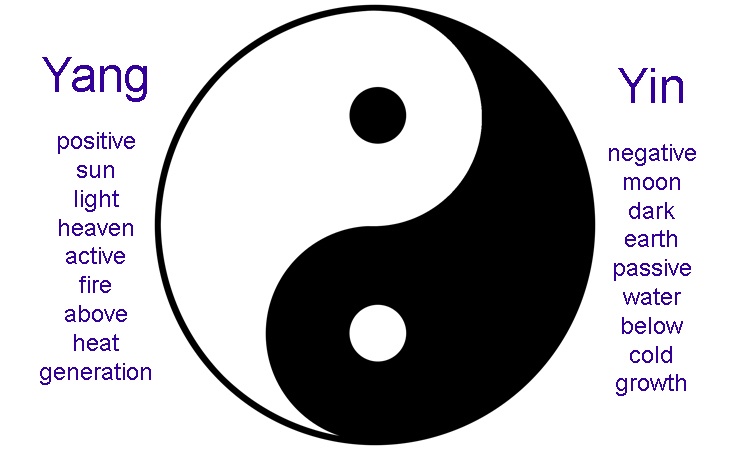 Their medical practice was very much based upon a philosophical model, in which everything in nature was associated with polarity, the two opposites of Yin and Yang. Health was a state of balance between those opposites. 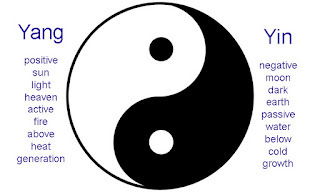 The great polarity is the symbol of traditional Chinese medicine. There are many ways of looking at history. With this initial look at the symbols used by the medical, surgical and allied professions we can see that there are links or threads that we can follow across the centuries to the days of antiquity itself, and even to the symbolism of mythology. 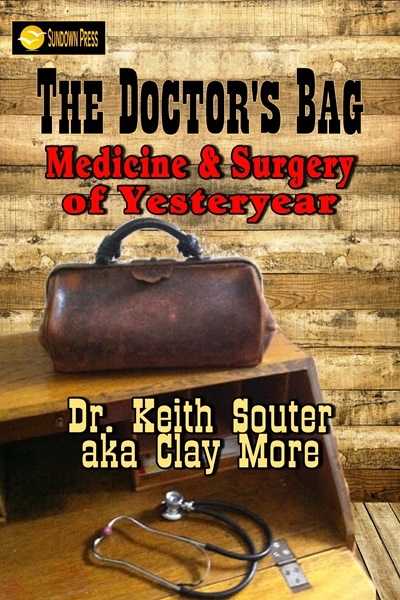 THE DOCTOR'S BAG - MEDICINE AND SURGERY OF YESTERYEAR has been published by Sundown Press, available on ebook or paperback. 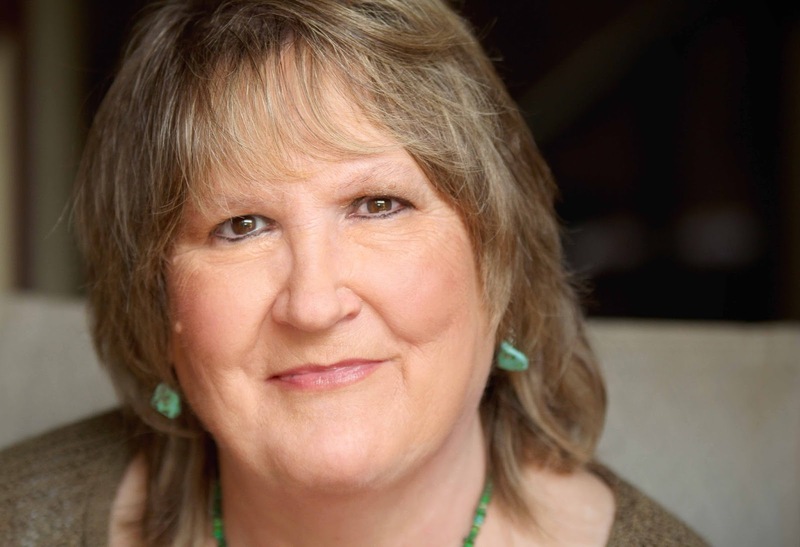 I sold my first book when I was 19. At the time I was PFC in the US Army, and an instructor in the helicopter crew-chief’s course at Ft. Rucker, Alabama. I was hard at work on a Civil War novel. The commanding general issued a “request” that all permanently assigned officers should write an article for Aviation Digest, a magazine dealing with army aviation. The lieutenant I worked for knew I liked to write, so he gave me $25 to write an article for him. The article was accepted, won best article of the magazine, which was a prize of $25. To the lieutenant’s credit, he gave me that money as well, then brought other officers to me…and for about three months, I was making more money writing articles for Aviation Digest than I was from my army pay. It was at the Aviation Digest that I met William E. Butterworth, now better known as WEB Griffin. I learned that Butterworth had actually had books published. I had never before met a published author, and I was thrilled. “What are you writing?” Bill asked. I wrote Girls of Carnation House in about five weeks and took the manuscript to him. “Why are you showing it to me? I can’t publish it for you.” He suggested that I go to the corner drugstore and find books similar to the one I had just written, get the publisher’s address, and send my story to them. I did just as he told me, and sent off my completed manuscript…no cover letter, no synopsis, just the manuscript and my address which, at the time was: PFC Robert Vaughan, RA27520287, HQ and HQ Company, USARV, Fort Rucker, Alabama. Notice there was no zip code…there was no such thing as zip codes then. Amazingly, I got an acceptance letter back from the very first publisher I sent my manuscript to. I was walking on air...I HAD SOLD A BOOK! Hemingway, James Jones, Harold Robbins had nothing on me! A sergeant I knew was about to lose his 1958 Impala. I agreed to take over the payments for the car. Payments were $92 a month, and I was making $121 a month, but hey….I HAD SOLD A BOOK! I would probably just pay the car off as soon as I got my contract from Saber Books. The contract arrived about two weeks later. For all rights Saber Books will pay Robert Vaughan, (hereinafter referred to as author) $100.00 advance against a royalty rate of ½ cent per book. Author attests that the work is his, and agrees to hold Saber Books blameless for any lawsuit arising with regard to plagiarism, liable, or any other injury. It had a place for me to sign my name. One hundred dollars? This is a book! It will be on bookshelves everywhere and I get only one hundred dollars? If you are thinking I didn’t sign the contract, you are mistaken. I signed the contract in a heartbeat! I WAS GOING TO BE PUBLISHED. Oh, and the 1958 red and white Impala? I got to drive it for three months, then I found someone else to take over the payments. When all the royalties for the book were paid out . . . my total compensation, counting the initial one hundred dollars, was $123.54, which was only about 20% of what I had made writing articles for the Aviation Digest. And by the way….except for the author’s copies they sent me. I never saw the book on any rack, anywhere. They did, however, publish four more books for me, and the amount paid for each book increased with each contract, and, for the last one I did for them, I received six hundred dollars. There have been over 400 books since then, including a few six figure contracts…..but nothing has ever quite matched the thrill of that first sale. War is a controversial topic, especially these days, yet world history has been undeniably defined by conflicts between humans. Since the earliest recorded war in Mesopotamia around 2700 B.C., societies have fought for independence, religious or ethnic reasons, and desire for riches, revenge, political power, natural resources, and land. Nations clash with each other and sometimes clash from within. There are guerilla wars, people’s wars, world wars, cold wars, bloodless wars…even forgotten wars. Arising from these conflicts are stories of heroism, cowardice, betrayal and loyalty unto death. War heroes, especially, seem larger than life and we honor them by commissioning statues and paintings of them, profiling their lives in books, and naming cities, parks and streets after them. When a military figure is immortalized in paint or stone, he is often shown along with his dearest comrade in arms–his horse. A mounted leader commanded from above the fray of battle–moving about the field and directing his troops, who were no doubt inspired by the sight of their courageous officer on a fearless horse. Obviously, it took a special horse to withstand the rigors and violence of war. Equine casualties were enormous. 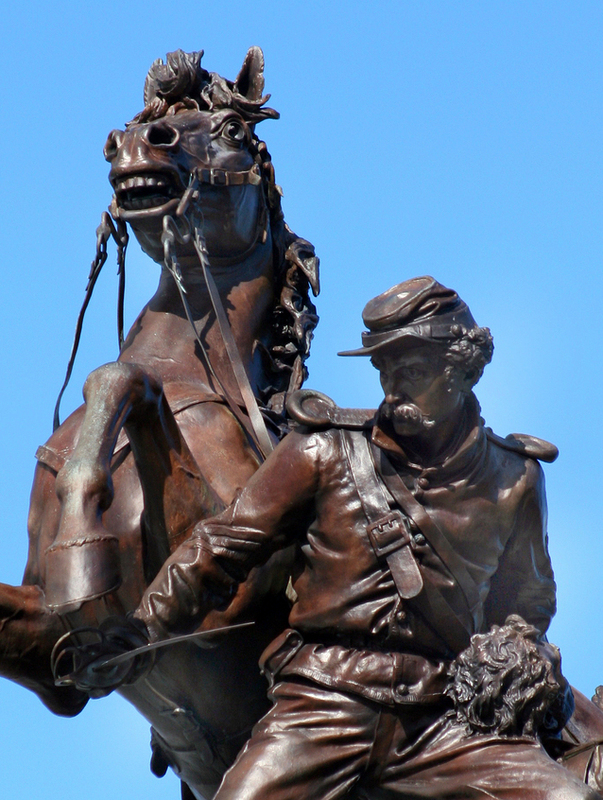 It is estimated that, for every soldier killed in the Civil War, five horses met the same fate. Here are profiles of a few notable horses who "served" during the War Between the States. 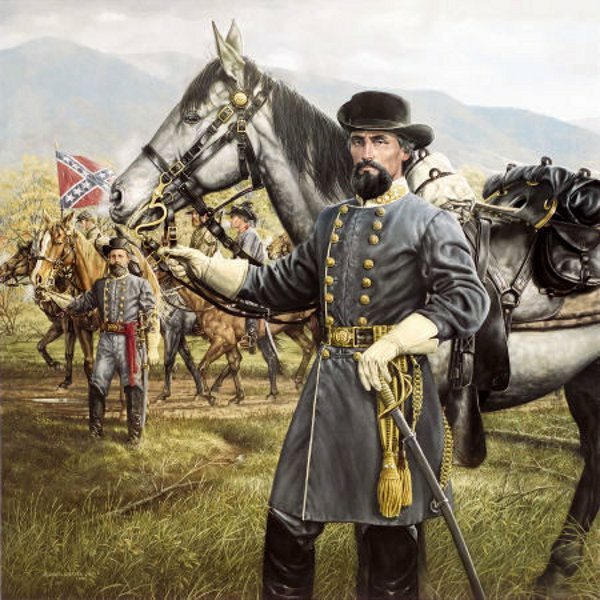 Confederate General Nathan Bedford Forrest claimed to have had twenty-nine horses shot from under him. They had heroic names like King Philip and Highlander. Most well-known was a big chestnut gelding named Roderick. A statue of Roderick was erected in Thompson’s Station, near the place where he fell. 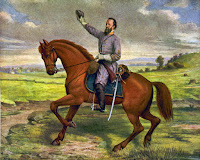 After General Thomas “Stonewall” Jackson’s death by friendly fire in Chancellorsville, Virginia, his beloved horse, Little Sorrel, was captured by Union forces on three different occasions. 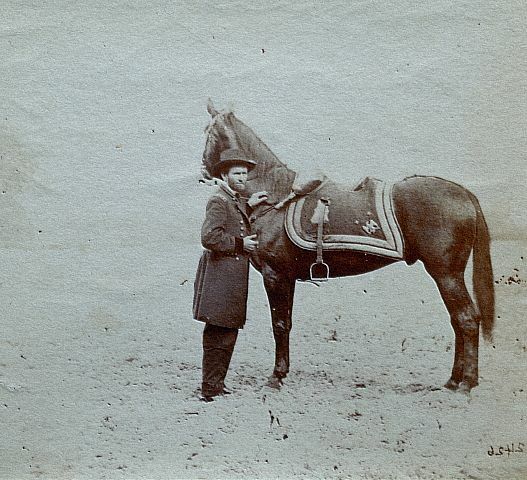 Eventually, the tough pony, described as homely and dumpy, was returned to the Confederacy and went on to become a hit attraction at festivals, including the New Orleans World’s Fair in 1885. Little Sorrel’s taxidermied remains are on display at the Virginia Military Institute. The most famous of all Confederate war horses was General Robert E. Lee’s Traveller, a handsome Saddlebred he bought for $200 and described affectionately as being "Confederate grey." 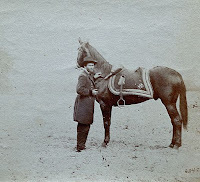 At Lee’s death in 1870, Traveller walked, riderless, in the funeral parade with his master's empty boots backwards in the stirrups. Traveller died just a year later. Egypt was quite literally a "gift horse." 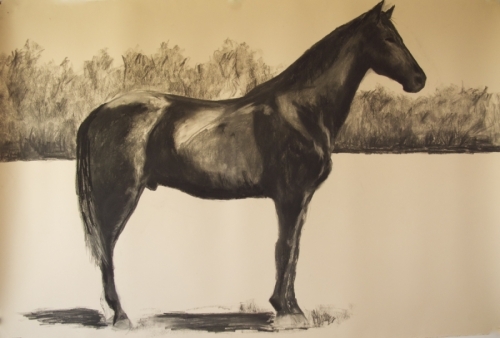 A group of Grant's admirers in southern Illinois (near the town of Egypt) bought and delivered the powerfully built thoroughbred stallion to the general, who was camped near Chattanooga. Grant promptly named the horse for the Illinois town. General William Tecumseh Sherman, who wrote the book on “total warfare,” owned Dolly and Sam, among others. Sherman sat astride a leggy bay named Lexington during his deadly “March to the Sea” campaign in 1864. 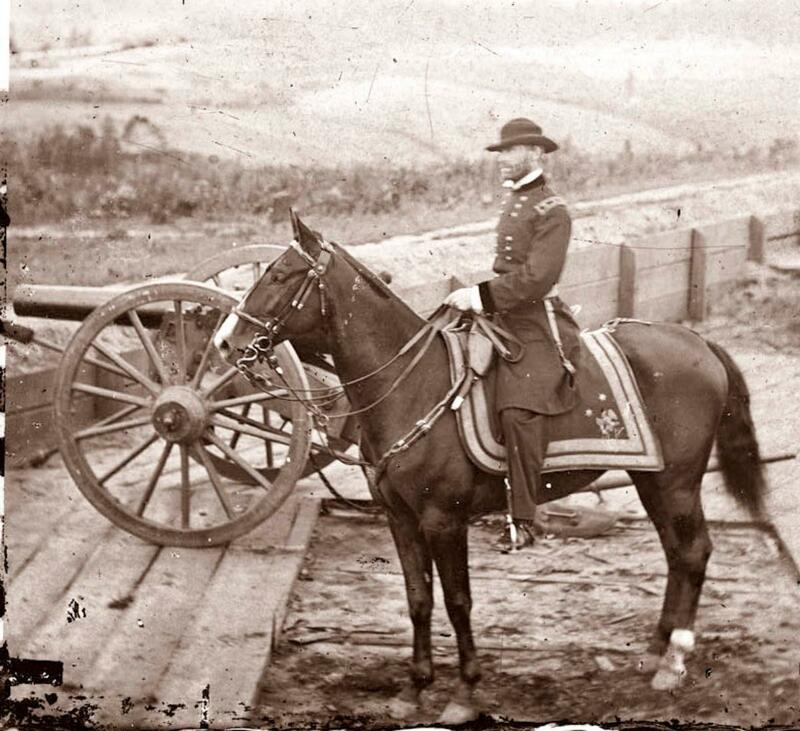 Sherman was another who lost several mounts in battle. 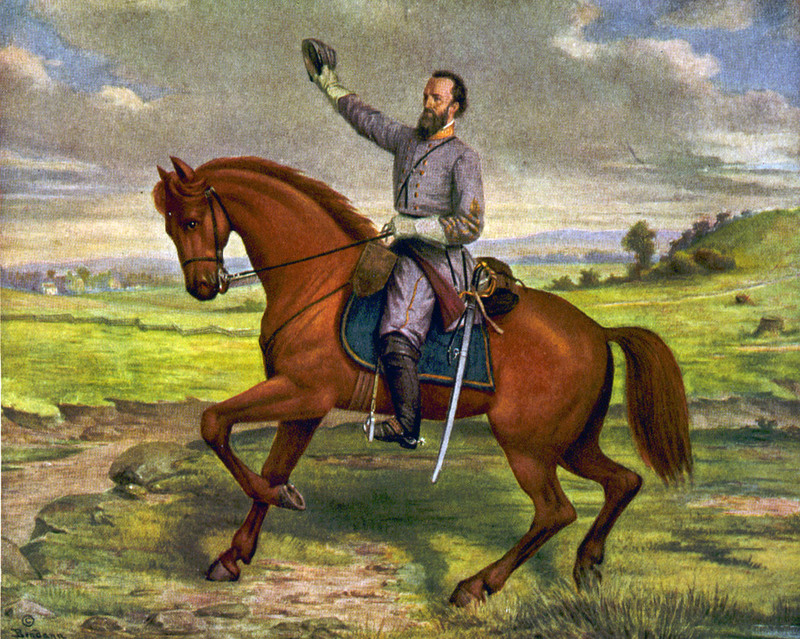 Three of his horses were shot during the Battle of Shiloh (Tennessee)–two of them killed as an orderly stood holding their reins. 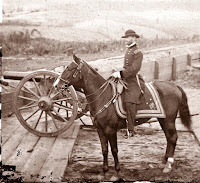 Unlike Grant, General Sherman was not so comfortable in the saddle. "General Sherman was a nervous and somewhat careless rider. He wore his stirrup-leathers very long, seeming to be almost all the time standing in the irons. This appearance was intensified by his habit of rising in the stirrups on reaching a turn in the road or some advantageous point of observation. 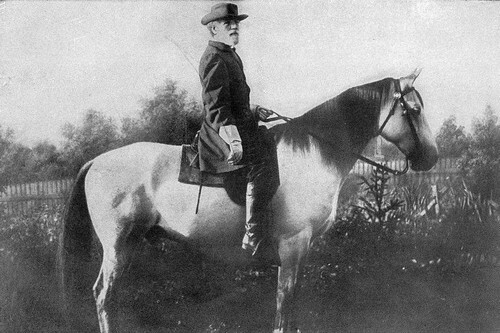 While always careful of his animals, Sherman did not appear to have that fondness for them that is so common among good horsemen." We’ll pay tribute to more famous war horses during my next Western Fictioneers blog (February 26). Boy- how about that John Meston? Some of you are nodding silently. Many of you, though, have never heard of John Meston. Not many people have, anymore, or know what a big influence he had on popular culture. Meston started working for CBS radio in the 1940s, initially in the program practices department and soon thereafter as a writer. By the early 1950s, Meston and his friend Norman MacDonnell (a director and producer) set out to create a new kind of radio program: a western, but not one like The Lone Ranger and other popular shows aimed at kids. 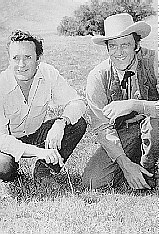 The two men, both in their late 30s at the time, were charged by their boss Hubell Robinson (CBS programming chief) to do a western series for adults, a serious drama rather than a melodrama. They discovered a project that had been shelved for three years, meant to be a cross between westerns and hardboiled detective stories starring a tough lawman named Mark Dillon. They kept the "hardboiled" approach, and made a slight change to the hero's name: he would be Matt Dillon, and the program would be called Gunsmoke. It would be a tough, hard-bitten show, reflecting the rigors and vicissitudes of frontier life. Sometimes the innocent would suffer. The hero would be brave, but flawed in some ways and afflicted with occasional self-doubt and a good bit of cynicism (like any good hardboiled detective). The germ may have appeared in earlier scripts that never made it to the airwaves, but everything else was created by Norman MacDonnell and John Meston. This included the supporting characters: Doc Adams, Miss Kitty, and Chester. 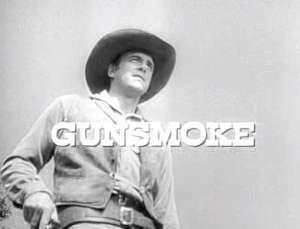 Gunsmoke debuted on the radio in 1952, and was a hit. It was praised for its realism; it was one of the most explicit (for the time) programs on radio. McDonnell produced and directed, and Meston was the head writer. 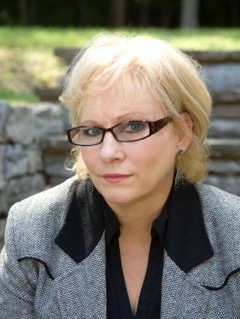 He wrote roughly 80% of the scripts in the show's first four seasons, fleshing out the characters (other episodes were written by McDonnell, Les Crutchfield, Kathleen Hite, John Dunkel, and a handful of others... Marian Clark would later also join the team and write many episodes). What little the audience learned about Matt Dillon came from the mind of John Meston. Matt had been a wild young cowboy who spent several years on the border in Arizona and New Mexico. 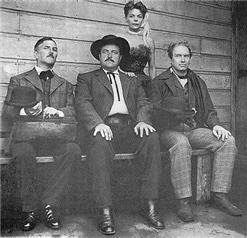 He could easily have become an outlaw, considering the company he kept -many of his old friends did- but he was inspired by an older lawman, who turned him onto the right path (in those early years it was common for Matt to meet old friends from his border days, and they were always extremely surprised that he had become a lawman.) Another marker of a Meston story: he often found ways to work his home town of Pueblo, Colorado into the dialogue. A surprising number of guest stars were on their way to or from Pueblo. CBS decided to turn Gunsmoke into a television show, which debuted in 1955 with an all-new cast (and a new last name for Chester, who went from Proudfoot to Goode). The radio show continued simultaneously, and would run until 1961. 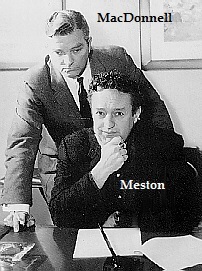 Meston and most of the other radio writers started producing scripts for the TV show as well, many of them adapted from past radio episodes. This was relatively easy to do, as both the radio and TV versions ran for 30 minutes, Sometimes the radio origin of a TV episode is obvious in the title; the updated versions often changed the names of guest characters who appeared by their original names in the title. MacDonnell, however, did not get to run the TV series, at least not at first: the netork hired Charles Marquis Warren as producer (and director of most episodes), with MacDonnell subservient to him. Except MacDonnell was NOT subservient to him, and the two feuded vigorously, leading Warren to quit halfway through the second season, at which point MacDonnell took over the reins completely. The radio program was canceled in 1961, after nine seasons. The TV version underwent major changes at the same time: with season 7 (1961-1962), they expanded to a full hour. This meant the stories were no longer as tight, and in the eyes of many, no longer as dramatic and affecting. More emphasis was put on the guest-star-of-the-week, and gradually some of the show's hard edge wore off. The stories no longer tended to be as dark and somber as they had been in the first several years. Another notable change: Marshal Dillon no longer moped around the graveyard as much. 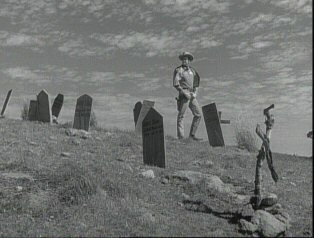 During the half-hour era, many episodes started with a voice-over monologue by the marshal as he wandered through Boot Hill. We learned more about Matt's internal life and thought process in these scenes, probably, than in the rest of the series put together. Turns out Matt was cynical, and even bitter at times. He seemed to hate his job, and the necessity of killing so many people and dealing so much with the ugly side of human nature. He also had a pretty low opinion of the riff-raff with which he was forced to fill up the cemetery. Of course, those monologues added to the hardboiled atmosphere and helped set the dark tone for the stories. If one were to view the series from the inside out, as a progression of stories instead of a TV production subject to external forces, I think it would be safe to assume that the fact Matt quit going to the graveyard and agonizing so much over his part in filling it indicated he had either found internal peace and accepted his role, or that he gradually became more hardened to it. In all, Meston wrote 183 of the radio episodes (out of 413). He went on to write 196 (of 635) TV episodes. That is 44% of the radio shows (mostly in the first four seasons) and nearly a third of the television episodes... plus 64 more that were adapted by someone else from his original radio stories. The very first episode of the TV show ("Matt Gets It") was a Charles Marquis Warren adaptation of a Meston radio script; the last episode of season ten was the final original teleplay by Meston ("He Who Steals," which centered on Festus). The first half of the show's 20-year run, and the entire Chester era, bore the heavy mark of Meston, who died in 1979. 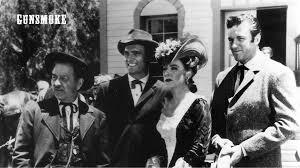 Norman MacDonnell, who also left Gunsmoke in 1965, passed away in 1979 just a few months after Meston. This past year, I was honored to be asked to participate in two more of the “Wolf Creek” collections that are the brainchild of Dr. 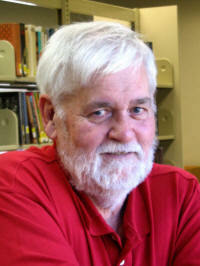 Troy Smith, a wonderful author and good friend. Troy’s vision, when he created the fictional post-Civil War Kansas town of Wolf Creek, was that it would be populated by a very diverse community. That, in itself, will cause its own brand of problems as the people of Kansas were sorely divided during the Civil War—and that conflict left its mark long after the War ended. THIS IS WHERE IT ALL BEGINS FOR WOLF CREEK! 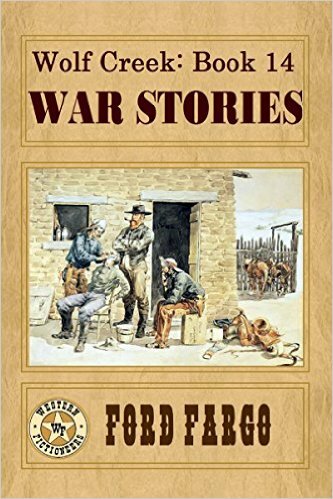 With over two dozen western authors making up the fabled “Ford Fargo”, author of the Wolf Creek anthologies and shared universe books, I have found myself in some very fine company to work alongside in these creations. The beauty of this project is that each author has the freedom to incorporate their character(s) into a loose framework that Troy lays out, and every shared story gets off to a great start, has no “sagging middle”, and comes to a very climactic ending—yet, it does so with the efforts of (usually) 6 authors per book. Imagine the thrill of being a part of such a collective effort—and seeing how flawlessly the eventual project comes out! In 2016, I participated in two anthologies. These are somewhat different from the “shared universe” books in which there is one story, divided into chapters. The anthologies are separate short stories, but they do propel the same story along to the completion, in many ways, a lot like the chapter books do. I had a story in a book that was published in May, Wolf Creek: Book 14—WAR STORIES. This was a fun one, because there is a creepy barber, John Hix, who lives in Wolf Creek. He claims to have had nothing at all to do with the Civil War, yet he’s always wanting others to talk about what THEY did during the War…and he has his own reasons. 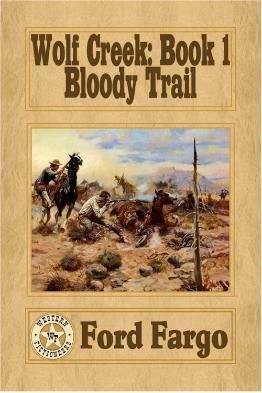 And let’s just say, there have been some “unexplained disappearances”… This was a bittersweet book, as the incomparable western author, Frank Roderus, was a contributor—and this was one of his last publications before he passed away. In my story, UNCLE JOHN, my character, Derrick McCain, discovers quite by accident that he has a daughter, six-year-old Viviana, that he didn’t know he had—and her mother is dying. But just as Vivi’s mother passes, Derrick is in for another surprise—one that troubles him to his soul: it becomes apparent that somehow, John Hix, the barber, is well-acquainted with little Vivi and her mother—and this is one man that Derrick doesn’t want anywhere near his family! The second book I contributed to this past year was called Wolf Creek: Book 18—HUNTER’S MOON. My story was THREE GOOD MEN, and this time, the town of Wolf Creek will soon be under siege by a band of raiding Kiowas who will show no mercy. They’ll reach the McCain family farm first, and though Derrick wants nothing more than to stay behind with the three men who’ve come to warn him and make their stand in his farmhouse, he knows he has to see his family to safety above all else. With the help of Sheriff Sam Gardner, a crusty lawman, Derrick and his wife, Leah, begin the trip to Wolf Creek in the dead of night under a hunter’s moon. But it isn’t long before Derrick realizes they are going to have to abandon the wagon and take their chances in the darkness of the forest to have any kind of hope of making it safely to Wolf Creek. Some of the Kiowas follow, and while Sam and Leah make their way through the night with Vivi and her baby twin brothers, Derrick battles the Kiowas to save his family. When daylight comes, will the McCains and Sam be alive to continue the journey to warn the citizens of Wolf Creek of the impending attack? 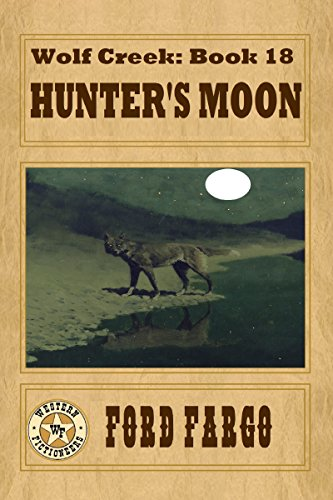 And what will become of the THREE GOOD MEN who have stayed behind to hold off the Kiowas and give Derrick, his family, and the town of Wolf Creek a fighting chance under a HUNTER’S MOON? She shook her head. “Forgive me. I shouldn’t even be thinking about my things when men’s lives are at stake.” She smiled at him as he glanced at her. “It’s natural. Thinking about everything you stand to lose,” he replied. “My family is all that matters. We will rebuild if we have to, of course. The most important thing is that we keep everyone…safe.” Her voice broke. She nodded, and kept putting one foot in front of the other, trying to calm her thoughts. Don’t be thinking the worst. But how can I keep from it? “Mama, Uncle John said he paid for some candy for me at the store,” Vivi reminded her. “Yes.” If John Hix was killed by the Kiowas, or if he went away forever, it would be a relief. Leah had never liked Hix, and she knew Derrick felt the same. They tolerated Hix for Vivi’s sake. And to be fair, Hix doted on their daughter. It was strange to think that the odd little barber knew Vivi better than she or Derrick…or, at least, had known her longer. Vivi nodded, but she looked downcast. Leah’s heart clutched. Vivi had suffered so much loss—leaving her home, losing her mother, and now, John Hix. Leah refused to consider the further impending loss that weighed so heavy on her soul right now. Where is Derrick? The thought nagged. Thank goodness Vivi was too young to understand what was happening, truly, at the moment. They could be in the process of losing everything. Everything, including their very lives. My character, Derrick McCain, is an odd hero because he is “just a man”—not a lawman or an outlaw or anything glamorous. He is a farmer who did some things in the Civil War he isn’t proud of. He’s half Cherokee and half white, and though he didn’t set out to be a “family man”, throughout the Wolf Creek series, he’s found himself in that situation under very different circumstances. Do you enjoy series such as the Wolf Creek stories? Leave me a comment! I always want to know what other people think! And if you have a Wolf Creek character included in this series, please tell about him or her and their role in the town of Wolf Creek.